From Libby, Pemberton, Danville, Andersonville, & Florence to "Sumptuous Dinners"
Gilbert Bailie was born in Ohio on December 21, 1836. He had twelve brothers and sisters. In 1851, Gilbert went to Cincinnati, for three years, an apprentice in the plastering trade. In 1853, his two brothers James and John were the first of the family to move west to Effingham County, Illinois. His brother Andrew followed in 1854 and the whole family in 1856. James and John were farmers. Andrew engaged in contracting and building. Gilbert earned his livelihood in Illinois in the plastering trade, no doubt working oftentimes with Andrew. Three Bailies in the 51st. In the autumn of 1861 with the country at civil war, Andrew (two years older than Gilbert) and Nathaniel (six years younger), signed up for military service with the Fifty-First Illinois Infantry. In February 1862, Gilbert followed their example and enlisted. All three were mustered into Company E, under Captain John McWilliams. Gilbert was mustered in on February 11, just three days before the regiment left Chicago for Cairo, Illinois—and "the field." At the time of enlisting he was a married man with an infant child. 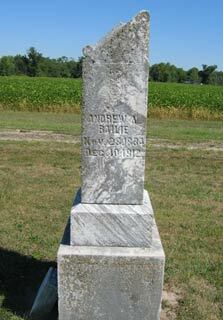 John Bailie enlisted in August 1862 in Company C of the Ninety-Eighth Illinois Infantry. Gilbert's Military Career. Gilbert was in the field with the Fifty-First Illinois through the New Madrid/Island No. 10 campaign, and then he was so ill in May and June 1862 that he was sent home on sick leave. He was back with the regiment in July and on railroad guard with the 51st on the Memphis & Charleston from Corinth to Decatur, then hurried north to Nashville and the Battle of Stones River. He marched through the ardors of the Tullahoma campaign and came to Chickamauga Creek with the regiment for the great battle there on September 19 and 20, 1863. On the 20th, Gilbert and his brother Nathaniel were tending wounded comrades with the Hospital Corps when the division hospitals at Crawfish Springs were captured by Wheeler's Confederate cavalry. Gilbert and Nathaniel were with the large band of captives who were walked the twenty miles to the railroad at Dalton, took the train for Atlanta, overnighted there, and then headed by railroad for Richmond. He and Nathaniel were processed at Libby Prison on September 29 and incarcerated at the Pemberton Building. Like most of his captured friends Gilbert was transferred to one of the prison buildings in Danville, Virginia in early December, 1863. By that time, however, Nathaniel had had a strokes of bad luck and good luck. He fell ill, so ill that Confederate prison authorities paroled in November. He was sent north on November 17, 1863 to parole camp and Federal hospital—and this at a time when the flow of prisoner exchange had utterly dried up. Gilbert's prison career, unlike Nathaniel's, followed the late-1863/1864 pattern of the regiment's Chickamauga captives. At the time Nathaniel left the Richmond prisons for the North, Gilbert still had over a year of confinement before him—and Nathaniel carried to the family in Illinois probably the last news they had of Gilbert until his release. On February 23, 1864 Gilbert was moved to prison hospital in Richmond for treatment of smallpox. On March 8 he was returned to the prison proper. Later in March or in April, Gilbert was moved from Danville to Andersonville, where nine of his regimental mates, captured at Chickamauga, died and were buried over the course of the next nine or ten months. When Andersonville was endangered by the approach of Federal forces in late 1864, Gilbert was transferred to the stockade at Florence, South Carolina. On December 10, 1864, he was paroled at Charleston. On December 14, he reported at College Green Barracks, Maryland, and, on December 16, he moved on to Camp Parole, Maryland. On December 26, he was given a 30-day furlough—finally, he saw his family in Illinois. His military travels were almost over; he reported, a few days late, at Camp Chase, Ohio, on February 1, 1865. On February 20, Gilbert was in Springfield, Illinois to be mustered out of service. There was some confusion about his paperwork—it looked as if he had never been mustered in—but finally he was mustered out on March 9, the papers giving an official muster-out date of February 10, 1865, and so Gilbert completed exactly his three years of service. The War Fate of the Bailie Brothers. Andrew was wounded at the Battle of Stones River on December 31, 1862, shot in the right arm; the ball was never extracted. He was taken captive and sent to Libby Prison, being "processed" there on January 16. This was early enough in the Civil War that the Exchange Cartel with some of its civility was still in effect, and Andrew was paroled at City Point, Virginia on January 26, just ten days after arriving in Richmond. He arrived a Camp Parole, Maryland a day later and stayed there some time while his wound was treated and began to heal. He was sent to parole camp at Benton Barracks in St. Louis on March 11 and reported there on April 8, 1863. The date of his formal exchange is unknown. His wounds prevented his return to the regiment in the field. The army took advantage of Andrew's pre-war building and construction background, and he was put in charge of various construction projects for the army in St. Louis. On August 13, 1863, Andrew was formally transferred to the army's "Invalid Corps", whose partially disabled men performed non-field-duty functions for the army. John, with the Ninety-Eighth Illinois, was severely wounded in the chest at Chickamauga. 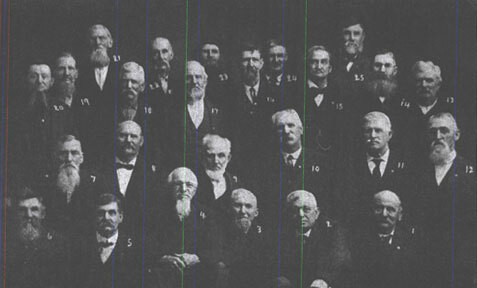 The Ninety-Eighth Illinois was part of Wilder's Brigade. Though Wilder's Brigade was in the Fourteenth Corps and the Fifty-First Illinois was in the Twentieth Corps, both the Ninety-Eighth and Fifty-First fought on the extreme Federal right on the 19th and 20th. When the Fifty-First lined up in the west Viniard Field at 4:30 on the afternoon of the 19th, the Ninety-Eighth was in position in the trees at the western edge of the field, not more than a hundred or two hundred yards off. John's military service records are not clear as to whether he was wounded on the 19th or the 20th (generally, this was a point that could not be made in the chaos of the two days' battle). If he were wounded on the 19th, the Bailie's of the Fifty-First might have become aware of it on the night of the 19th while the Fifty-First lay on their arms a few hundred yards in advance of the Ninety-Eighth and while hospital attendants (among them Gilbert or Nathaniel perhaps) carried wounded men off. The divisional hospitals of the Fourteenth Corps and the Twentieth Corps were all located around Crawfish Springs. Gilbert and Nathaniel were captured on September 20 as they served as hospital attendants. Perhaps Andrew and Nathaniel lingered at the hospitals because John lay there. They continued as hospital attendants for several days until they were marched off to Confederate prison, leaving John behind awaiting parole—either having seen him or not. If John were wounded on the 20th, there was much less likelihood that he would have been found by his brothers. Many seriously wounded Federal soldiers lay for a week on the ground where they fell before they were finally picked up and taken to battleground hospitals. In this case, Andrew and Nathaniel probably marched away to Dalton, Georgia without bidding John farewell. Like many other critically wounded Federal soldiers, John was selected for parole by Confederate officers and was to be sent back through the Federal lines around September 30. Though he was named on the select list, he was never heard from again. Presumably, he died in the interval between the compiling of the list of parolees and actual transport to the Federal lines. The date and place of his death remained unknown, but he must have died around September 27-29, 1863 and have been buried in the Chickamauga ground by his Confederate captors or, more likely, by fellow captive Federal soldiers. Four Prisoners of War. All four of the brothers, thus, at one time or another, for a brief period or a long period, were captives of the Confederate Army. Nathaniel's Last Visit Home. Nathaniel, the youngest of the four enlisted brothers and one of very few among his captured mates from Chickamauga, was released early enough, after passing time as a paroled prisoner awaiting exchange, to return to the regiment (another being Elon Clark of Company K, and another Thomas Gregg of Company H). As we have seen, Nathaniel was captured at Chickamauga while with the hospital corps, was paroled, sick, early-on from Virginia prisons. He was ill in St. Louis military hospitals during most of 1864. Sometime, in the midst of hospitals and parole camps, Nathaniel had a leave of absence to visit home. He visited his parents, Robert and Sarah Bailie, in Effingham and for two months worked as a clerk in a local business, putting aside money for his parents. It was a gift visit from the middle of nowhere, one son escaped by some miracle from Richmond prison, yet on his own way to death, bearing news of Gilbert and no-news of John—a tiny surcease in the middle of national trauma. Nathaniel returned to the regiment on November 28, 1864, just in time to be lost in the maelstrom of the Battle of Franklin on November 30. He was never heard from again. The Sanitary Commission. There is a poignant coda to the ends of Nathaniel (youngest) and John (oldest). In 1865, the family made inquiries with the United States Sanitary Commission, hoping for additional information about the two missing brothers. The Sanitary Commission could tell them only what they already knew, that the men had disappeared in battle and battle-aftermath and were, officially, considered dead, casualties of the war, by their regiments. Nathaniel's Demise. Among the pension documents for Nathaniel is this statement by his commanding company officer on November 30, 1864 at Franklin, Lieutenant John Johnson: Nathaniel "was with his command at Franklin Tenn Nov. 30 1864. He remained with his company during the engagement at that place until the position of the army with which we were connected retreated in great confusion, the enemy pursuing closely, killing and capturing many. The following night the entire army fell back to Nashville leaving the enemy in possession of our dead and many of our wounded. Said Bailie, as far as I can learn, has not been heard from since the engagement. It would be easy in a confused retreat of half a mile for a man to be killed without the knowledge of his friends. It was impossible under the circumstances to have an eyewitness of all of our killed." Lieutenant Johnson said that some of his company were taken prisoner and none of them saw Nathaniel among the prisoners after the battle. Confederate forces held the battleground the night of the battle and for the next two weeks. Presumably, Nathaniel received a hasty burial in an unmarked grave at Franklin. Gilbert after the War. After the war, Gilbert returned to Illinois and lived in the town of Altamont. At some point, he abandoned plastering and turned to harness-making as a livelihood and was in business with his son Samuel as a harness-maker and dealer. Gilbert's death certificate lists him as "retired" from that business. In the post-war years, Gilbert's wartime ailments began to mount up as serious and numerous health issues. His absurdly modest $12.00/month pension was increased to $30.00 by special act of Congress on February 28, 1907. Gilbert was active in the local Robert Anderson Post No. 632 of the Grand Army of the Republic. He was quartermaster of the post every year after its organization up until his death. He served one term as commander of the post. Each year Gilbert and his family celebrated the anniversary of his release from Confederate prison with a great feast—"a sumptuous dinner". 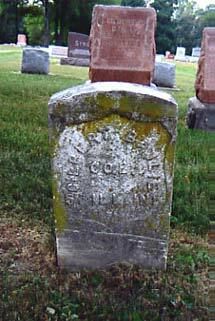 Gilbert died at 76 years of age in 1913. The following obituary appeared in the Altamont News on Thursday, October 16, 1913. In the passing of Gilbert Bailie, soldier, citizen, church man, Altamont has lost a resident of recognized ability and worth. Mr. Bailie was a victim of that dreaded disease, cancer of the throat, and his sufferings were intense for many weeks, yet he bore it all patiently, cheerfully. The end came, Sunday night, at half past twelve. Gilbert B. Bailie was born in Knox County, Ohio on the twenty-first of December, 1836 and lived to the ripe age of seventy-six years, eight months, twenty-one days. He came to this state with his parents, during the fifties, and settled near the present village of Mason. On the sixteenth of October, 1859, he was united in marriage to Miss Catherine Hollis, who preceded him to the life beyond, August 19, 1908. Five children were born to this union, namely, Samuel Bailie of Chicago, Edward Bailie, who died at the age of forty-two, Louis Bailie of Terre Haute, Indiana, Mrs. Margaret Engeldow of Chicago, Mrs. Minnie Hesemann of Altamont. Mr. Bailie, at the age of twenty-six, answered his country's call. He bade farewell to a loving wife and little babe and enlisted at Chicago on the tenth of February, 1862 in Company E, Fifty-First Illinois Volunteer Infantry. His three years of service took him through many campaigns and he participated in ten important battles, Stone River and Chickamauga being two of the most severe. At Chickamauga, he was taken prisoner and for fifteen months suffered unto hardship and privation at Andersonville, Libby and Florence. On the tenth of December, 1864. Mr. Bailie was released from prison and sent to Union headquarters. The family celebrated this date with sumptuous dinners for many years in order, as Mr. Bailie said, that he might have some of the good things he was compelled to forego while a prisoner. By reason of the expiration of service, he was honorably discharged at Springfiled, March 10, 1865. Mr. Bailie and family moved to Altamont in 1871 and for many years he engaged successfully in business at this place. He was united in marriage, February 9, 1910, to Mrs. Elizabeth Young who survives. In addition to the wife and children, two sisters, Mrs. Jane Winterringer of Arcola and Mrs. Catherine Hollis of Fredonia, Kansas; fifteen grand children, one great grand child and many other relatives and friends are left to mourn Mr. Bailie's departure. Having been raised by deeply religious parents, he was converted early in life and united with the Methodist Church where he faithfully worshipped and labored as long as health would permit, while Christ, the hope of glory, was the anchor to his soul even when the storms of physical suffering swept over him. Funeral services were conducted from the First M. E. Church on Tuesday afternoon by the pastor Rev. F. O. Wilson. Special music was rendered by the choir. The large congregation and the beautiful floral offerings gave tribute to Mr. Bailie's splendid worth to the community and to his country. Twenty soldier boys followed the form to Union Cemetery to perform the last sad rites. 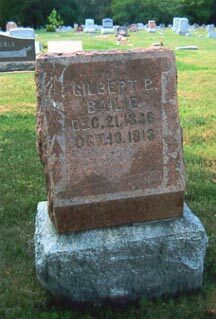 Below: the two stones that mark Gilbert Bailie's grave at Union Cemetery in Altamont, Illinois, and, on the right, the grave of Andrew Bailie at Mason Cemetery at Mason, Illinois. 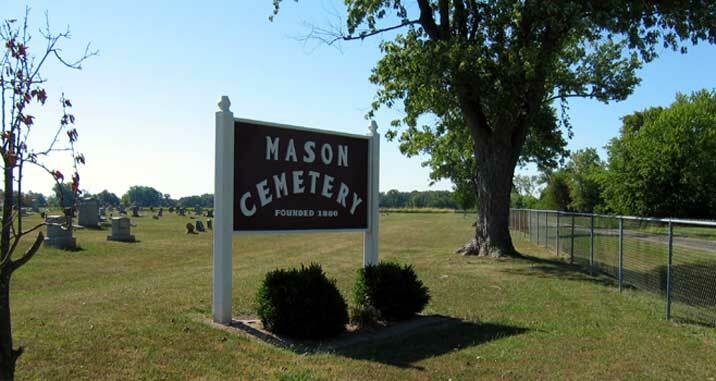 Mason Cemetery itself is pictured below the three pictures of individual stones. Family information, Sanitary Ccommission research with the New York Public Library, pictures, and obituary appear here courtesy of Gilbert Bailie descendant Judith Milde of Illinois. Gilbert Bailie, Compiled Service Record, 51st Illinois Infantry, Records of the Adjutant General's Office, 1780's-1917, Record Group 94, National Archives and Records Administration, Washington, D.C.
Gilbert Bailie, Pension File, Records of the Veterans Administration, Record Group 15, National Archives and Records Administration, Washington, D.C.
Nathaniel Bailie, Pension File, Records of the Veterans Administration, Record Group 15, National Archives and Records Administration, Washington, D.C.
Larry F. Banbury, ed., The Sesquicentennial of Effingham County 1831-1981, Effingham: Banbury Publishing Company, 1982.